This year, the Blackboard upgrade has been scheduled to take place between 7 pm on Sunday 22 July and midday on Monday 23 July. Blackboard will be unavailable during this time, so please do not schedule any activities requiring Blackboard during that period. We are pleased to announce that Blackboard is now running as an externally-hosted service. If you experience any issues, refreshing your browser cache (http://www.refreshyourcache.com/en/home/), completely closing your browser and restarting it, or rebooting your machine should fix the issues. Please let us know if you experience any persistent issues: tel-help@bristol.ac.uk. Find out more about the changes at our project page. For Blackboard support, training and advice, please contact us: tel-help@bristol.ac.uk. As part of the move to external hosting project, we will be upgrading Blackboard to version Q4 2016. This brings many improvements and increased functionality as well as a new visual theme. Accessibility and mobile improvements will remove course themes and course menu colour customisation options. The Learn 2016 Theme is cleaner and has ‘responsive design’ elements, allowing it to resize and reorder content to take best advantage of the screen size. It will give users a more consistent experience across devices and is optimised for delivery over mobile. Many functions that previously did not work well on mobile devices, such as discussion boards and tests, are much improved. This theme has been created to follow accessibility standards (WCAG 2.0 principles [link: https://www.w3.org/2004/10/wcag2-nav/wcag20princ.html]) which results in a clearer design that works for all users. Good practice such as keyboard navigation and suitable colour contrast are built into the theme with no need for users to enable them prior to use. 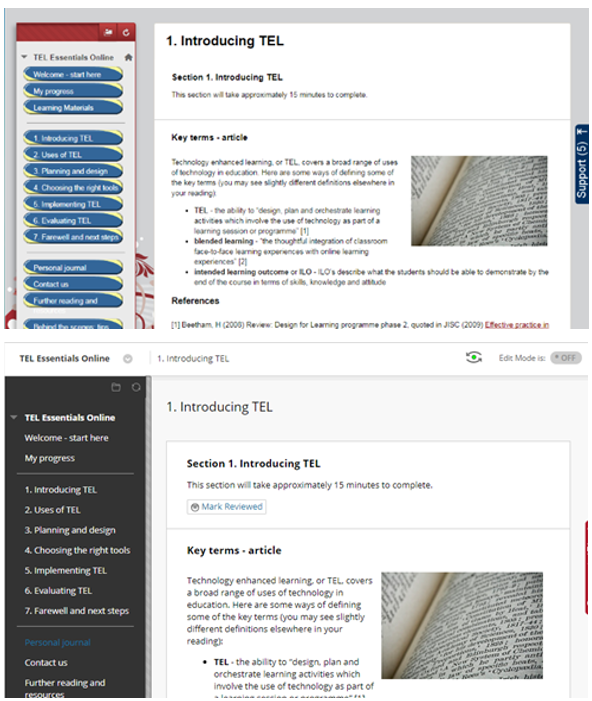 To further improve accessibility, legacy ‘course themes’ and colour customisation features have been removed. Course differentiation can be achieved using banners and images, we will provide guidance on how to create and upload graphical content using free online tools. Contact us at tel-help@bristol.ac.uk to arrange support/training. We can run bespoke sessions for a school or teaching team on request. Unavailable between 7:00 pm on Sunday 6 August and 2:00 pm on Monday 7 August for upgrade. Blackboard course (unit) rollover will take place on 1 August 2016. We recommend that staff do not edit 2015/16 courses after 5 pm on Friday 29 July, as changes made after this time may not be copied into the 2016/17 courses. All 2016/17 courses should be available to staff by 2 August. Mediasite links will automatically be added to those 2016/17 courses which have Mediasite links in 2015/16 courses. The links will automatically update to the associated 2016/17 catalogue, where the Mediasite recordings are surfaced for students to view, once live. Turnitin assignments will be copied into 2016/17 courses, but given new start, end, and post dates – so these will need to be changed before making the courses available to students. Note that Turnitin set an expiry date for all assignments in a course that is six months after the course creation date (ie 31 January 2017), after which all Turnitin assignments in the course will become read-only. This expiry date is automatically changed to the latest post date of any Turnitin assignment in the course – so it is worth adjusting the dates as early as possible. A table showing details of how Blackboard course elements are copied during rollover can be found here. If you have any questions, please contact tel-help@bristol.ac.uk. Blackboard is available again, following the planned downtime earlier today. On 21 July (8:00am to 3:00pm) IT Services will undertake essential maintenance work to the database that supports Blackboard. Blackboard will therefore be unavailable on that day – we apologise for any inconvenience caused. The work is being done to improve the stability of the service. There will be a further half day of downtime on the morning of Thursday 4 August, for essential updates to Blackboard. We do not anticipate any further planned downtime over the summer. All new courses are created as “Unavailable” so students will not be able to see them yet. When you wish to switch them on simply look for the course availability on the “Qwickly” module on the home page of Blackboard and switch the course to “On”. All staff will have been added to the new versions of courses that they were attached to last year. Students are being added as they are enrolled on SITS. We also provide “Hub” courses for areas where more than one Unit code of students are being taught together – we are in the process of copying last years Hub courses and these should be available early next week. The 2014 Blackboard upgrade will take place between Tuesday 22nd July and Friday 25th July. A temporary read-only replacement service will be available during this time. Please do not edit courses after Sunday 20th July until the upgrade is complete. Edits made during this time will not be saved. The last date to request external accounts before the upgrade is Friday 18th July, by 4pm. The familiar interface remains in the new version (which is known as SP14), but there are improvements in the student and staff experience, particularly in relation to online submission and marking. Once again, the content of this year’s unit courses will be copied into 2014-15 versions from 1st August. This means that you may see 2013 as well as 2014 courses on Blackboard. Historic and current versions are clearly identified by a year suffix. Further information and short videos on some of the new features can be found on the Blackboard Upgrade website.